Sailing the Seven Seas – somehow this has been lore since the ancient times. Think of the Odyssey or Sinbad the Seafarer. Or, think of one woman who did it for seven years, covering 34,000 miles with her husband on a 31-foot sailboat. Wendy Hinman. The adventuress and speaker is also the award-winning author of two adventure books full of humor and armchair thrills. 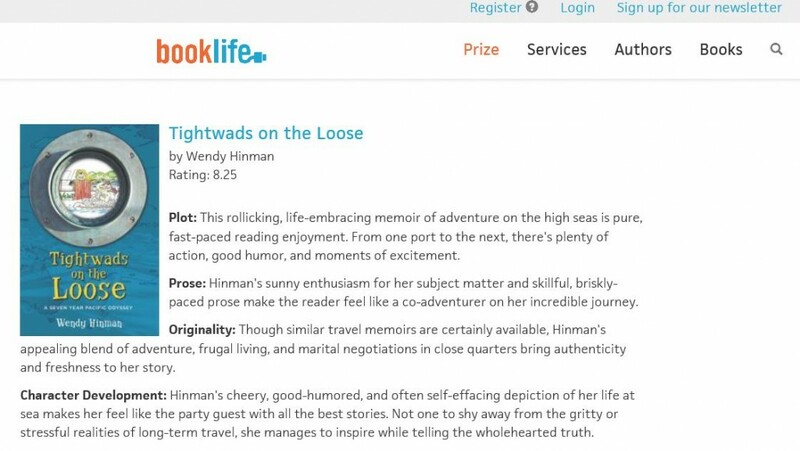 “Tightwads on the Loose”, the book about her own harrowing adventure won the Journey Award for best true-life adventure story and was selected as a top travel book for women. “Sea Trials” tells the riveting story of a family circumnavigating the globe in the times before GPS, while encountering pretty much everything from being shipwrecked on an uninhabited island to pirates and near-famishing. This story, a Kirkus Best Book of 2017, is incidentally that of her husband when in his teenage years. Wendy’s natural gift for story-telling makes both books memorable page-turners. 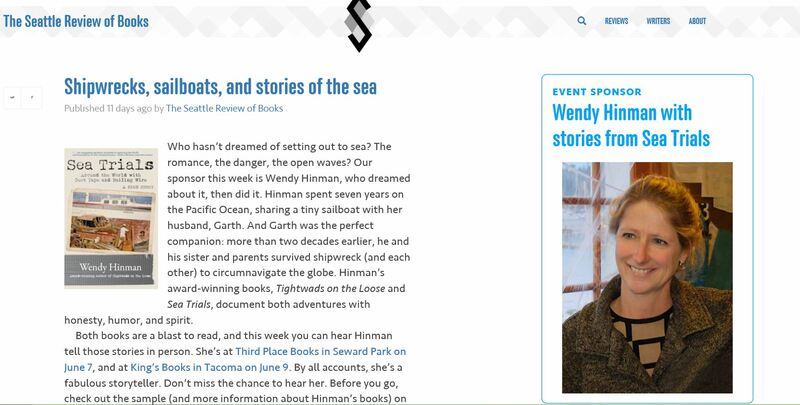 Award-winning author Wendy Hinman will sign her books at the Lakewood Film, Arts, and Book Festival on Friday and Sunday. Susanne Bacon: Wendy, you have been through quite a lot of hair-raising adventures when sailing. What made you relive even the most harrowing ones when writing them down? Wendy Hinman: It was fun to revisit those memories and tease out the lessons and the humor they offered. I had a popular blog in the early days of blogging and a large email list, so I shared some of these stories along the way through the blog, email newsletters, and magazine articles. But, sharing our adventures through a book required a very different type of writing, using action and dialogue. I needed to transform smaller events into a series of scenes to build an overarching story arc that would compel a reader to read all the way to the end. That dictated which events I chose to include in my book. I had to decide which close encounter with a ship—there were many—to feature, based on the pacing of the story and include the details that make it feel vivid so readers feel as though they are experiencing it themselves. My photos and careful notes helped me remember those vivid details to enrich my descriptions. Susanne Bacon: You are also an internationally sought-after speaker. What seem to be the topics best loved by your audience? What do you think is the reason for this? Wendy Hinman: People love to be entertained and always enjoy a good story, so I offer professional quality slideshows full of pretty pictures and exciting adventures that event organizers appreciate to intrigue and keep their audiences happy. I’ve earned a reputation for being a reliable, top quality presenter, so the more presentations I do, the more invitations I get. Also, since my book is about sailing offshore, my experience offers valuable information to those who wish to do it themselves. I offer many how-to talks at boat shows and make sure that my talks are entertaining and fun, but also that they include valuable information for those who want to learn these skills. I can’t tell you how many times I look out in the audience and see people attending the same presentation for the third or fourth time, laughing and taking copious notes. I try to feature different anecdotes and stories and examples so each presentation feels fresh and fun. My Toastmasters training has helped me practice my talks so that I am more relaxed and let my natural humor show. People learn through story and the same stories can be used to demonstrate a variety of lessons. And when people enjoy a presentation, they remember it better. I also offer talks about book writing and book promotion because I’ve learned so much since I turned my stories into two award-winning books: lessons about the craft of writing, about the publishing industry, about how to market books; and about how to turn your book into a bestseller. 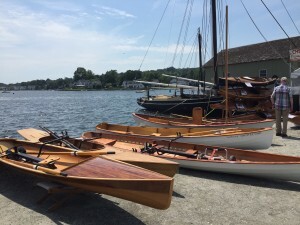 Susanne Bacon: You have been sailing since the age of six. Are there any sailing adventures that you would like to experience yet and maybe write about? Susanne Bacon: You are also currently the editor of the Writers Connection, a bi-monthly newsletter on the craft of writing. What do you recommend aspiring (auto) biography writers? Wendy Hinman: The most important thing any writer can do to develop the craft of writing is to read a wide variety of books. Notice what works and what doesn’t in the story: how authors play with tone, pacing, language, description, and character development to immerse the reader in the story; how they handle transitions and the passage of time in the story; and how they leave the reader with something that lingers after the ending. For any author, being an active participant in the literary community is helpful. Support other writers and bookstores. Develop relationships. Of course, you may have even further and totally different questions for Wendy Hinman. 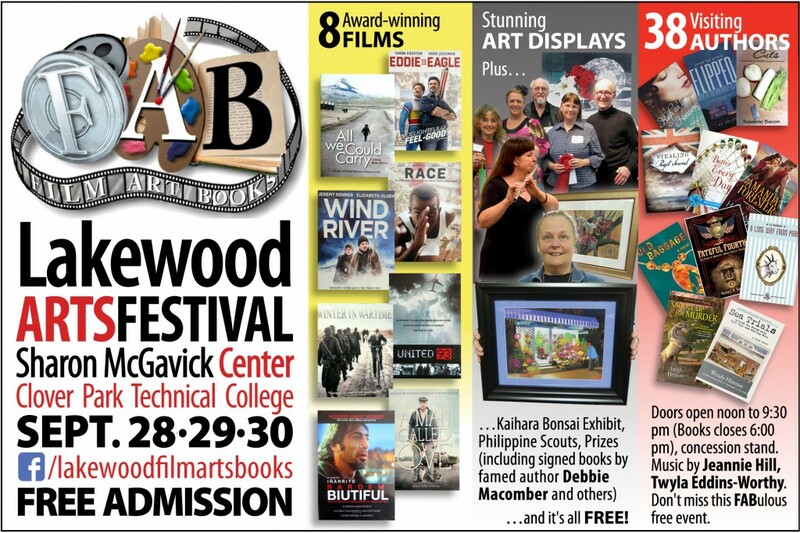 The 6th Annual Lakewood Film, Arts, & Book (FAB) Festival takes place on September 28, 29, and 30, 2018 from noon to 9 pm at the Shirley McGavick Conference Center at Clover Park Technical College. The book/author section is open from noon to 6 pm. 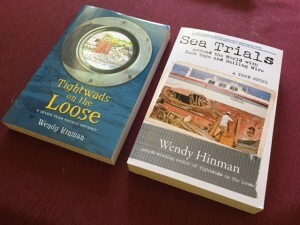 Wendy Hinman will be signing her novels on Friday and on Sunday. Please find further information at www.facebook.com/lakewoodfilmartsbooks/. Over 300 gorgeous wooden boats, 120 presentations, dozens of exhibitors, live music all day every day, great food and camaraderie. 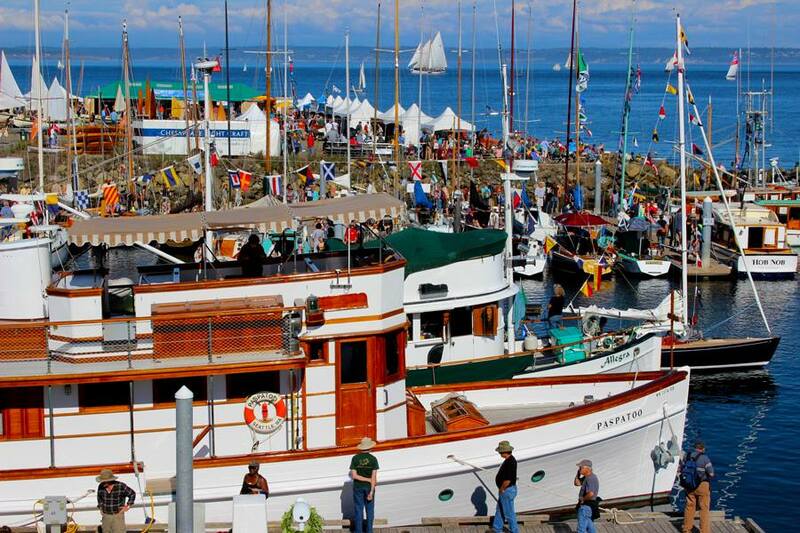 Don’t miss this fun event in Port Townsend September 6-9. Love film, art, and books? Put the Lakewood Festival on your Calendar Sept 28-30. Wendy Hinman be there selling and signing books with many other authors. Catch a film, peruse the wares of countless artists and take home a personally autographed book. Award-winning author, Wendy Hinman will regale us with tales of sailing the world from her two true drama-on-the-high seas adventure books. 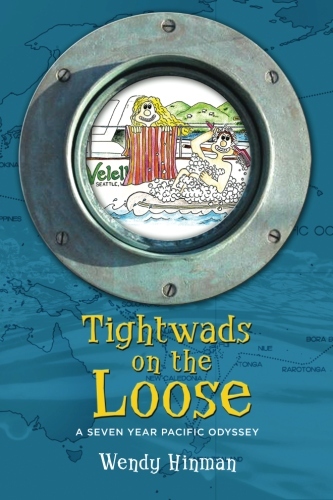 Tightwads on the Loose is a light-hearted memoir about the 7-year, 34,000-mile voyage she took with her husband Garth aboard a small violently rocking sailboat where she alternated between feats worthy of Wonder Woman and Suzy Homemaker. Full of humor and armchair thrills, Tightwads on the Loose was selected for the literature program for Western Washington University, won the Journey Award for best true life adventure story, and was selected a top travel book for women. 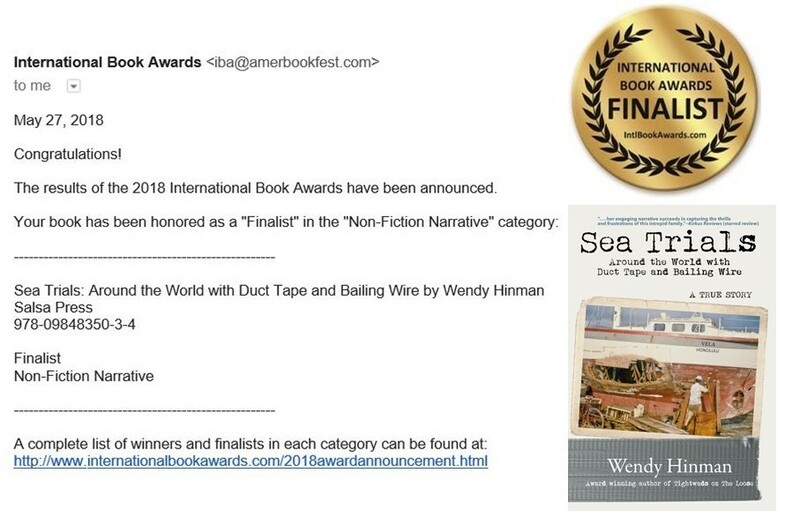 Sea Trials: Around the World with Duct Tape and Bailing Wire recounts the gripping story of Garth’s disaster-riddled voyage around the globe as a teenager with his family in the 1970s. Both books have garnered favorable attention in national press, and Sea Trials was named a Kirkus Best Book of 2017 by Kirkus Reviews. Don’t miss this engaging storyteller and the intriguing photos from adventures afar. 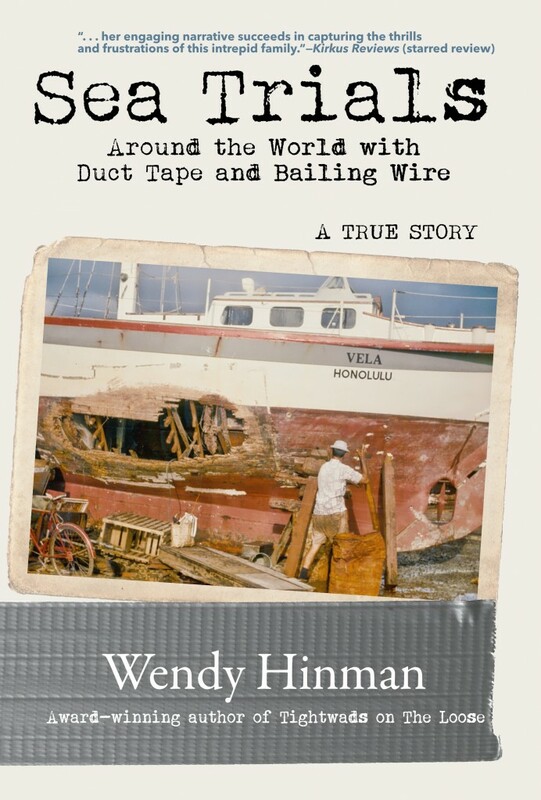 Sea Trials: Around the World with Duct Tape and Bailing Wire by author Wendy Hinman. 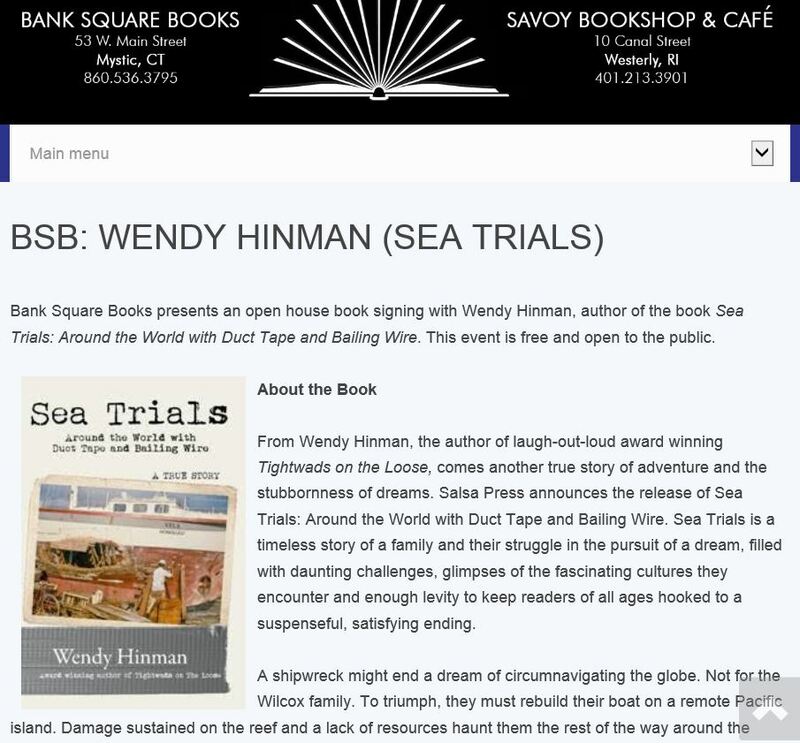 Wendy is an adventurer, speaker and the award-winning author of two books, Tightwads on the Loose and Sea Trials. 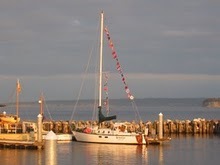 Sea Trials, her second book, tells the exciting story of the harrowing journey of the Wilcox family. A shipwreck might end a dream of circumnavigating the globe. Not for them. To triumph, they must rebuild their boat on a remote Pacific island. Damage sustained on the reef and a lack of resources haunt them the rest of the way around the world as they face daunting obstacles, including wild weather, pirates, gun boats, mines and thieves, plus pesky bureaucrats and cockroaches as stubborn as the family. Without a working engine and no way to communicate with the outside world, they struggle to reach home before their broken rig comes crashing down and they run out of food in a trial that tests them to their limits. Wendy Hinman’s books and presentations are filled with humor and hard-won lessons that amuse and inspire. Don’t miss the chance to hear her present while she is in town. For more information, visit her website www.wendyhinman.com. 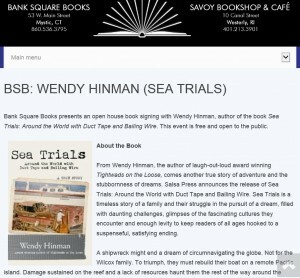 Join award-winning author Wendy Hinman as she discusses Sea Trials, her suspenseful tale of the Wilcox family and their struggles in pursuit of a dream to sail around the world. It’s a true story of the determination and survival of parents and their teenage children as they face of shipwreck, wild weather, pirates, thieves, gun boats, mines, scurvy, and starvation. 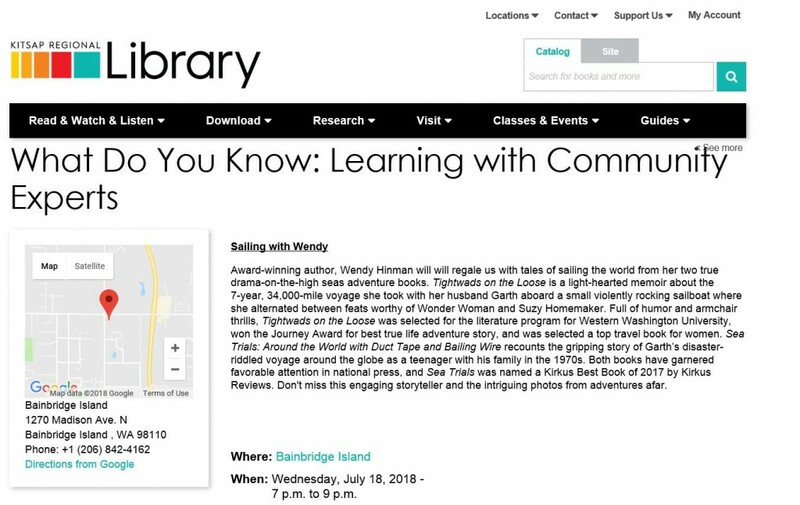 She’ll also share stories from her own 7-year 34,000-mile adventure aboard a 31-foot boat with the teenaged hero of Sea Trials, now all grown up. Despite being shipwrecked as a boy, he was eager for another ocean voyage. Her first book, Tightwads on the Loose, which details their adventures has been a hit for years.